Home » Student Bloggers » Baking Through the CIA » Baking Through the CIA: Choux Me The Money! 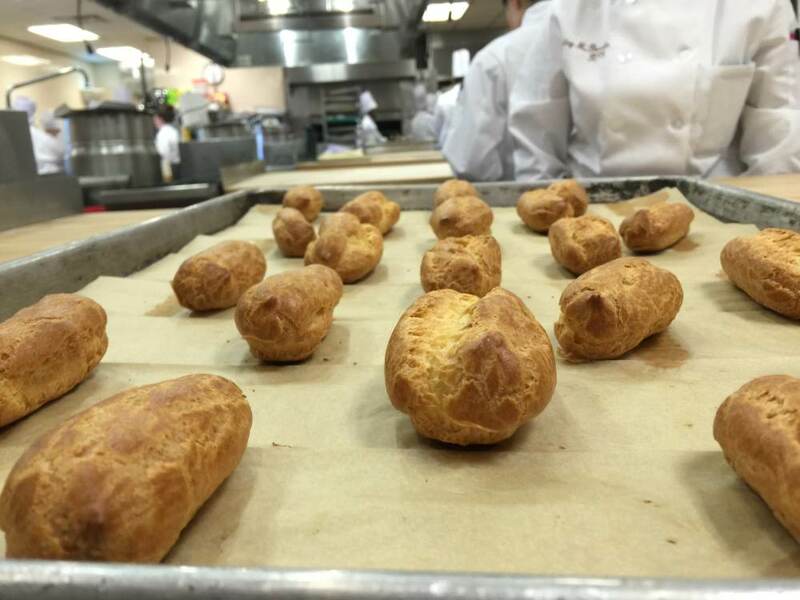 Baking Through the CIA: Choux Me The Money! 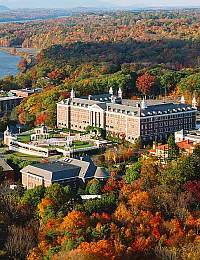 Semesters at the CIA are broken into 15 weeks. 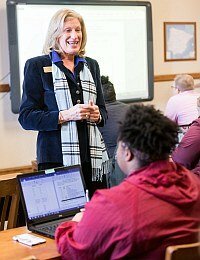 We are given the majority of Mondays off during the first semester, with the exception of 5 days that are devoted to lectures conducted by our chefs. This week marked the first of those lectures, focusing on the death-defying art of knife skills. As pastry students, our program has yet to put much emphasis on knife skills, as they won’t be utilized until a bit later in our education. Even so, it is never too early to start. Our chef began the class with a quick intro to the dangers of food allergies, before moving into his demo. He ran through basic cuts using a potato, slicing in all varieties of sizes from ¾” chunks, to paper-thin slivers. 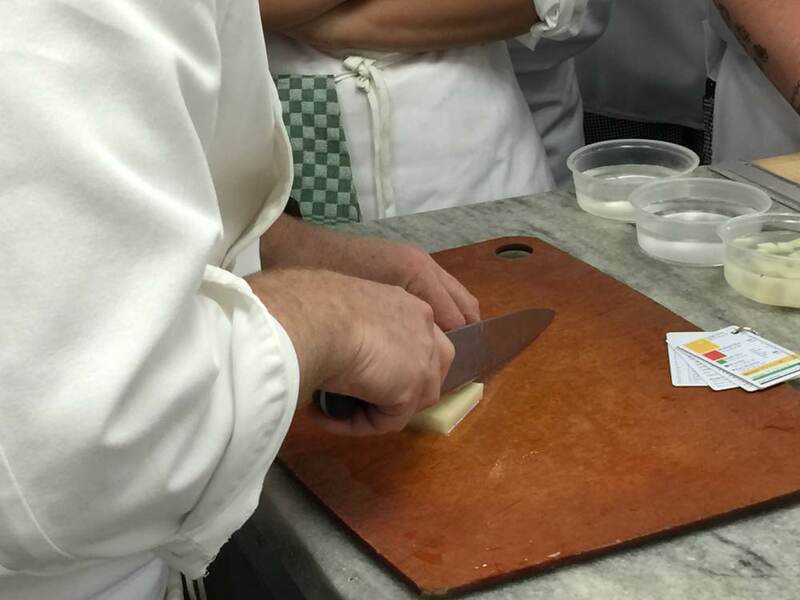 His blade control was impeccable, impressing the class as he sliced potatoes so thin, they were translucent. He then sent us on our way to fumble through our slow and nervous cuts, as we, or perhaps just I, feared winding up in health services. Surprisingly, only one person cut themselves at the very end of class while cleaning their blade. It was a very cool introduction to our gear, and I look forward to practicing some of the more complicated cuts in the coming months. 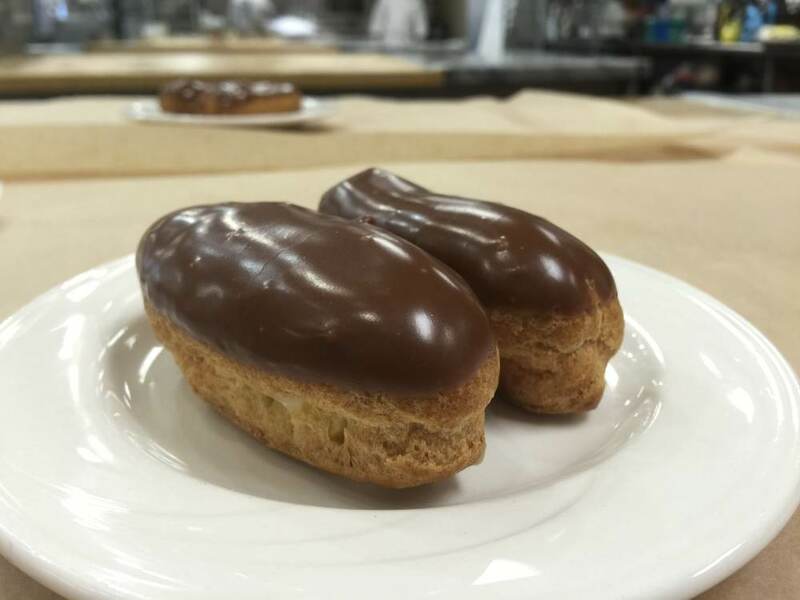 The next day, we moved back into the bakeshop, where we tackled pate a choux and pastry cream for éclairs. We were instructed that every individual would be responsible for a recipe of pate a choux and pastry cream. Half the class would work on one, while the other half would work on the other. Upon completion of one recipe, they would switch over to the one they had yet to do. In my case, I started with the pate a choux. Having taken last week’s difficulties and criticisms into account, I had spent more time learning the recipes in advance. I watched the videos supplied by the school and set up my timeline and notes prior to the start of class. This time, I was prepared. I set out towards the pot room with zeal, having noted exactly what dishes I would need in advance. I managed to be one of the first to complete my mise en place for the day, having a few minutes to spare before line up, inspection, and the chef’s demo. The Chef ran through both items in his demo, starting with the pastry cream. He displayed just how ferocious one must be when it comes to mixing the starched cream in order to avoid curdling. Without seeing the technique in person, and watching the grip and motion of the whisk, I believe it is likely more people in the class would have wound up with inferior products. He then moved on to pate a choux, showing us the proper consistency of the dough, as well as the best test methods for determining whether it was at its optimal consistency. These included letting the dough hang from the paddle, as well as dipping your finger into it and watching the way it settled. If the dough hung from the paddle in a single, pointed, triangular shape, or if the dough settled in what was described as a “Dairy Queen” swirl on the tip of your finger when held up, it was ready. During the demo, Dieter Schorner, the chef responsible for the popularization of the modern crème brûlée, stopped in to say hello. It was only as he was leaving that our chef informed us who he was. Seeing such an important culinary figure wandering the halls of the school is extremely impressive, and apparently a semi-regular occurrence. You just have to keep an eye out for them. After the demo, I rushed back to my station to claim one of the two burners available at our four-person station. My pre-cooking and mixing went off without a hitch, and I had my piped out éclairs in the oven in no time. Something that we’ve been taught here is to use bake times on recipes more as suggestions than strict guidelines. The rule is, a product is done when it’s done. Though the recipe called for the choux to be baked for 45 minutes, mine were done in 28. This is likely due to the oven running hotter than it was set for. They came out a beautiful buttery golden color and were near perfection. The only real issue brought up during their evaluation was the width of some of them. I need to work on my piping skills, but other than that, they were great. My pastry cream came out equally as good. I had been forewarned about the dangers of letting it sit idle on the stove, so I exerted as much effort as possible to keep a fast and steady mix going at all times. It was perfectly smooth and melted on the tongue like liquid velvet. I was extremely satisfied with my performance for the day. In BIET (Baking Ingredients & Equipment Tech. 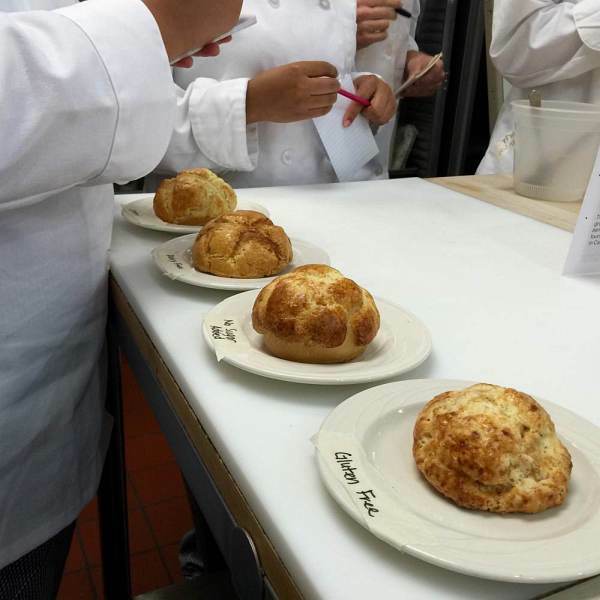 ), we took a trip downstairs to the bakeshops, where we attended a showcase in Chef Coppedge’s class. The focus of this showcase was alternative ingredients and their effects on products. 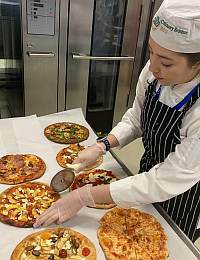 Each student was tasked with choosing a base recipe and making multiple batches that varied in some manner from the base. This included such things as sugar-free, gluten-free, and low-fat variations. Each student stood by their stations, giving a rundown of their processes and results. In the short time, we were allowed to be there, I stopped at the pineapple bun, lemon-lavender macaron, and pretzel bun stations. 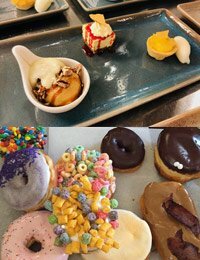 It was incredible to see and taste these altered products. Some were near indistinguishable from their base, and the ones that were not at least within the same realm. It seems like an exciting class, and I can’t wait to tackle this project myself. Later on in the week, back in the kitchens, it was time to finish and fill our éclairs. Each student was responsible for making chocolate fondant, reconstituting their chilled pastry cream, filling their éclairs, and plating them for the chef to evaluate. 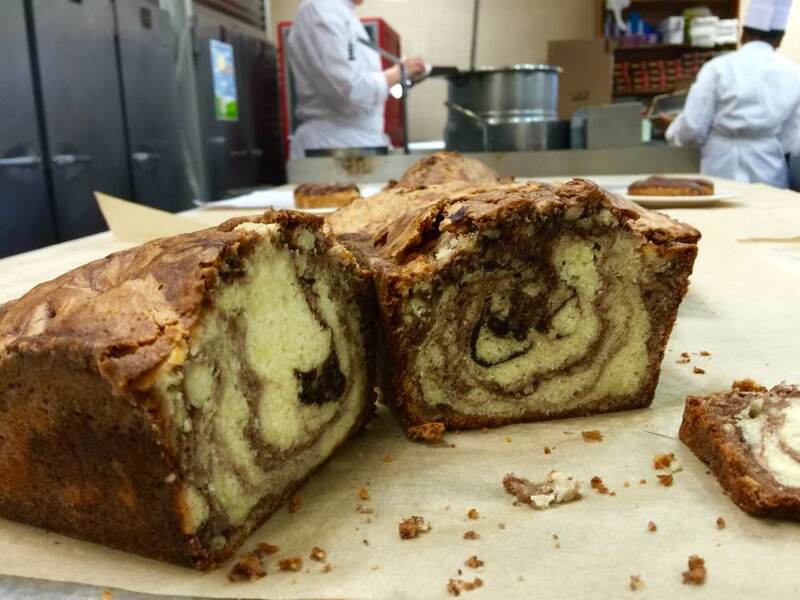 In addition to these individual tasks, each group was responsible for producing three loaves of pound cake. Similar to Tuesday, the class split, tackling different item productions before switching when completed. My group was assigned the pound cakes first. 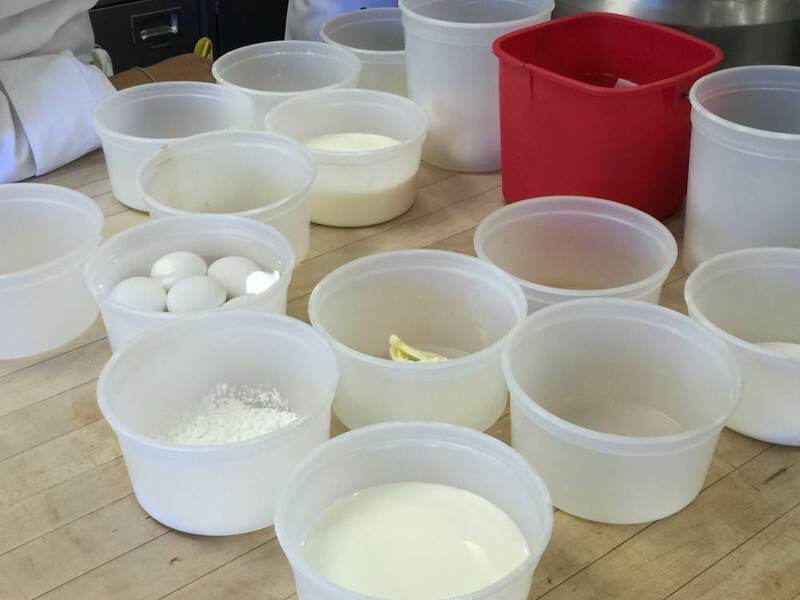 I rushed to the dish room to get a jump on my mise en place, again being one of the first to finish. Unfortunately, that momentum did not carry on through the day. Pound cake uses a very high liquid to fat ratio, meaning the emulsion made when mixing the two is delicate. Anything from adding the liquid too fast, to one of the ingredients being too cool, can lead to the emulsion breaking. Unfortunately, that’s what happened to us. I can’t say for certain what caused the break, but I would guess the temperature of the butter, as well as the initial mixture of eggs, were to blame. We had no other option than to mix it at a higher speed, for a longer length of time, in hopes that we could pull the emulsion back together. We also took a blowtorch to the outside of the bowl, in hopes of heating it up enough for it to homogenize. We got lucky, and it came back together. Unfortunately, it had eaten away a large chunk of our time. We were left with very little time to produce our fondant and complete our éclairs. On top of that, tempers in the kitchen were flaring, as dirty dishes piled up in the dish pit. Despite our errors throughout the day, my partner and I managed to finish our productions. Though quite a few of my éclairs appearance were not up to par, I was left with enough good product to show the chef for my evaluation. Our pound cakes turned out all right as well, suffering only minor tunneling. Overall, we both received good remarks from the chef. 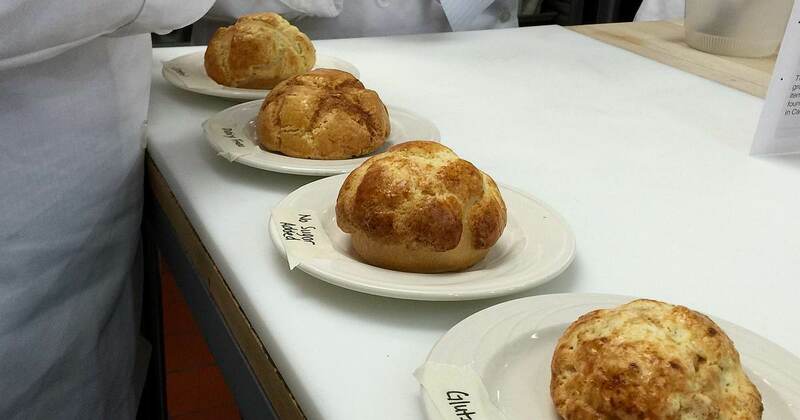 As our fourth kitchen class came to a close, it’s evident a chasm has formed. This is a profession of speed, accuracy, and teamwork. We work fast, and pick up each other’s slack. Some of the class has started to really acclimate to the level of professionalism we must practice, while the rest hasn’t quite gotten there yet. We need to function as a singular unit in order to keep production flowing, and until everyone is on the same page, we will continue to have issues with such things as the dish pit. Only time will tell if those who are lacking will ultimately conform to their surroundings. Aside from issues with teamwork, work quality continues to improve, and the coming weeks are sure to hold some surprising and exciting things. I look forward to seeing them.